AIRPORT IMPROVEMENT Magazine is the only brand focused exclusively on airport construction; all the players; all the time. You sell when airports are buying. Airports are buying when they're building stuff, and they're building more stuff now than ever before, and that's the environment that is captured by AIRPORT IMPROVEMENT Magazine. We provide the audience and the mindset for you to sell. No wasted circulation. In order to exact the same reach with any association you would have to buy three separate ads to do what one does in AIRPORT IMPROVEMENT Magazine. No wasted editorial. Other publications have to cater to internal association business limiting space used for real editorial. 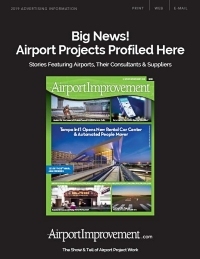 AIRPORT IMPROVEMENT Magazine is 100% project editorial, no fillers and no fluff. Your advertising dollars buy more. No matter where your ad is placed it is surrounded by relevant editorial. Speaking of advertising dollars, AIRPORT IMPROVEMENT Magazine is competitively priced. Compared to other airport publications its rates are similar, but when the superior editorial, circulation, and reader time and involvement is factored in the rates become a sensational value. Contact us today for package pricing, space availability, or to launch your campaign today!